What is the best gun for hog hunting? UTS-15 on the cover page of Turkish ArmiETiro Magazine. They call UTS-15 a Hollywood Star! Thank you to ArmiETiro for this great article and test. UTS 15 against to dinosaurs at upcoming Jurassic World movie. T-Rex hunting time! Gun Review: UTS 15 Marine 12 Ga.
34- US Bullpup Community has UTS 15 as their poster gun! 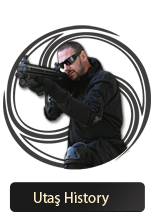 US Bullpup Convention is an annual weekend gathering to celebrate the firearms platform known as the Bullpup! thanks to them using UTS 15 as their cover photo on facebook page. 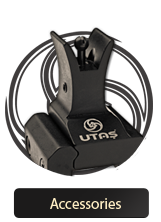 UTAS-USA is an American Company specializing in firearms design, engineering and OEM manufacturing. Arguably, UTAS is one of the top sporting firearms design companies with their designs being voted "Gun of the Year" by the NRA's American Rifleman Magazine in 2006 and again in 2007. Although UTAS continues to win awards for beautiful designs, the heart of the company is innovation. Innovative mechanical design, innovative manufacturing processes and innovative materials used in firearms production, define UTAS and set the company apart from other's in the firearms industry. Along with numerous patented design innovations, the new UTS-15 shotgun recently developed by UTAS will be the first shotgun ever produced with a receiver produced 100% from polymer. 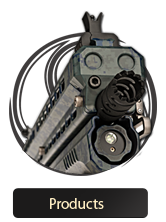 In fact over 80% of the gun is fabricated from fiber reinforced injection molded polymer. Of course using new lightweight materials in firearms has to be backed up with solid engineering and that's exactly what UTAS does.